The holidays at this time of year mean a lot different things, but good food usually is at the top of most everyone&apos;s list. One park at Walt Disney World certainly is enhancing that aspect of the season this year. Long known for its culinary diversity, Epcot has added yet another way to experience the food and beverages that are native to the 11 countries represented in its World Showcase. And new this year is a collection of edible items for the holidays. The Magic Kingdom, for many, is the focal point of Walt Disney World. However, this is where my blog ends on how the parks celebrate the holidays. Before you even step within the Magic Kingdom, you will see the front area decorated, and giving a taste of what’s inside. Having gone last year, it seems … Continue reading "Celebrating the Holidays at Walt Disney World – Magic Kingdom"
Like the other parks, Epcot has its own unique large Christmas tree. However, when you enter the park, you don’t notice anything holiday related, until you reach the World Showcase. Then, hold on to your Mickey Santa hat, because there are Santas everywhere! Each country has at least one special live presentation, done throughout the … Continue reading "Celebrating the Holidays at Walt Disney World – Epcot"
During the holiday season, the Studios is transformed to a Winter Wonderland. Before the entrance way, you will see their huge Christmas tree, decorated with scenes from Disney’s animations. Not only is this tree decorated with familiar faces, but all around the base are figures and even enlarged movie reels showing scenes from some of … Continue reading "Celebrating the Holidays at Walt Disney World – Disney’s Hollywood Studios"
As soon as you reach the Animal Kingdom entrance, you see a huge Christmas tree decorated with what else? Animals! It’s simply beautiful, and in some ways, it resembles the one in the Animal Kingdom Lodge, though any similar ornaments are remarkably bigger. Within the park itself, you won’t see much changed for the holidays, … Continue reading "Celebrating the Holidays at Walt Disney World – Animal Kingdom"
Now, on to the Wilderness Lodge. Their tree has more wilderness and American-Indian inspired ornaments, like tee-pees: They also have the added bonus of visits with Santa at this resort! Over at the Animal Kingdom Lodge, designed by the same person who created the Wilderness Lodge, they’re decorations are just as beautiful. 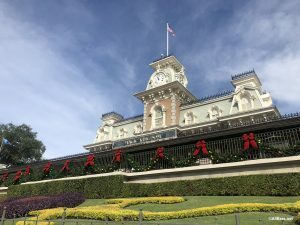 At this resort, … Continue reading "Celebrating the Holidays at Walt Disney World – Resorts Part 2"
My husband and I are back from celebrating the holidays at the happiest place on earth, Walt Disney World. You may recall I began blogging prior to our trip in December. I had hoped to give live updates throughout the trip, but I ran into some technical difficulties. Now that I’m home, I’m ready to … Continue reading "Celebrating the Holidays at Walt Disney World – Resorts"